Purchase Your New Home With Efficiency In Mind. Efficiency Nova Scotia has partnered with Nova Scotia Association of Realtors and Viewpoint Realty Services to make the energy performance of homes easier to access and understand. Whether you own your home, are planning to build, buy or sell, an energy assessment can provide information to help complete energy-saving upgrades and access to incentives. If you are the property owner, now you can take this a step further and share your EnerGuide information on the ViewPoint Realty website. This will enhance your property’s cut-sheet with the energy performance information of your home. Talk to your REALTOR® about also getting the EnerGuide rating included with the listing on MLS®. Taking the initiative to get an EnerGuide label, and displaying it on your listing, demonstrates transparency. Buyers appreciate listings that provide full disclosure of any potential issues or concerns. Displaying your EnerGuide label answers questions before they are asked, and can speed up the transaction process. As more people share their labels, we can build energy literacy in the community and make energy efficiency easier to understand. Buyers are looking to better understand the energy performance of the homes they are purchasing, and now they can do that and more. A Home Energy Assessment is an analysis of your home’s entire building envelope, space and water heating equipment, and ventilation system. Certified Energy Advisors conduct a full evaluation of your home, and provide you with customized recommendations to help you save energy and money. By completing the recommended upgrades using mortgage financing, you can benefit from low interest rates and a low monthly payment. If you’re interested in putting an offer in on a home, but haven’t obtained ownership yet, contact us to learn how you can have an energy assessment the same time you do a home inspection. If you’ve recently purchased a home, book a Home Energy Assessment. When you get your label and information sheet, contact us if you’d like to share your EnerGuide label on Viewpoint. The more labels we can share means a more informed real estate community and more informed choices by future buyers. If you have already listed your home or if you plan to list in the near future, book a Home Energy Assessment. You can use this energy assessment to highlight the energy efficiency of your home, upgrade it prior to listing, or provide access to incentives to the new property owner. When you get your label and information sheet, contact us if you’d like to share your EnerGuide label on Viewpoint. We’ll have you fill out a form providing your consent to share this information, and you will have the ability to remove consent if desired. If you do decide to perform upgrades prior to listing, make sure you book a follow-up assessment, and share that label, so your listing reflects the great work you’ve done. Regardless of whether or not you have done renovations, other jurisdictions have shown that just having the label and sharing it as part of a real estate transaction leads to faster sales and sales prices closer to list because buyers have a clearer idea of the total cost of ownership. 1. Book an initial Home Energy Assessment. 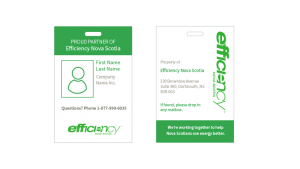 Look for an official Efficiency Nova Scotia Partner ID Badge to confirm their identity when they arrive. The majority of your home’s heating must be provided by electricity. Please visit our website for full details. Your home must be located in Nova Scotia and be at least 6 months old. Single-family homes, both detached and side-by-side row homes, homes with two or less units that share a common passageway, year-round cottages, and mobile homes on a permanent foundation are all eligible. 2. Review your Home Energy Assessment Report. Within 2 weeks of your initial assessment, you’ll receive a detailed report with prioritized recommendations to help you save energy and money. You’ll also receive a helpful summary report from Efficiency Nova Scotia, providing further details on average home upgrade costs and anticipated energy savings. Identifying the upgrades and energy efficiency products that are right for you. 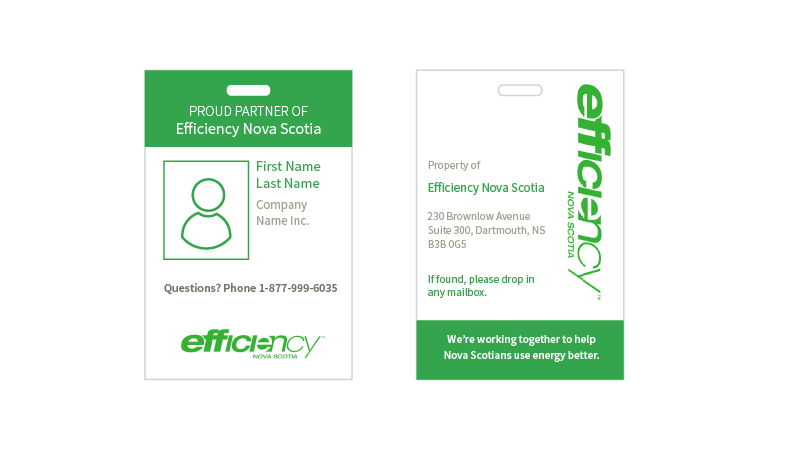 To contact Efficiency Nova Scotia, please call 1 877 999 6035 or email info@efficiencyns.ca. 3. Update your Viewpoint listing. Work with your REALTOR® about getting the EnerGuide rating included with your listing on MLS®. Use your home’s energy efficiency as a sales tool. Use your EnerGuide evaluation to prioritize work prior to listing, or pass on an upgrade plan and access to incentives to the new homeowner. Access home energy performance information of participating properties to learn what the operating cost of your new purchase might be. Compare EnerGuide scores of participating properties. Access valuable information and financial incentives for improving your home’s energy efficiency. Improving energy efficiency means lower space and water heating bills. Improved insulation and reduced drafts reduces heat loss and keeps your home warmer in the winter and cooler in the summer, improving overall comfort. More airtight construction and better ventilation mean less dust and pollen entering the house and you’ll breathe easier. A properly insulated foundation means warmer floors. Energy efficiency reduces air pollution and greenhouse gas emissions responsible for climate change. When you ask for an EnerGuide Label you get standardized third-party information about rated energy consumption, similar to labels on cars and appliances. This gives you an idea of how comfortable and healthy this home will be to live in, and how much it will cost to operate and maintain. An EnerGuide rating gives you an idea of average monthly and annual energy bills before buying, and allows you to compare with other homes. The EnerGuide label allows you to compare the energy efficiency of the home to a similar new home built to code. Some older homes have been upgraded to use less energy than a new home. EnerGuide can help you see these changes. If the house you are buying is shown through the EnerGuide rating to be energy efficient, you could qualify for a mortgage loan insurance premium refund. If you decide to do eligible upgrades to make your newly purchased home more energy efficient, get incentives of up to $5,000 from us, and get mortgage premium refunds of up to 25%. An EnerGuide label lets you know how much energy a house uses in a year, kind of like the mileage rating on a car. The lower the rating, the less energy the house uses, and the more comfortable it will be to live in. The label looks different, has it changed? Yes! The new EnerGuide Rating System launched in Nova Scotia in September, 2017. The rating used to be between 0-100, the higher the rating, the more efficient the home . Now, the rating is in units of energy, and represents the energy usage of a home. It is in gigajoules (GJ), where one GJ equals 277 kWh (kilo Watt hours) and is equivalent to the energy in two BBQ propane tanks. I have an EnerGuide label from a few years ago (version 10.51) can I share this on Viewpoint? Unfortunately, no. This project is specifically designed around the new EnerGuide Rating System. The new rating system in GJ/year allows the energy performance of homes to be directly compared and is a key benefit of energy labeling and disclosure. Your existing EnerGuide score is still a valid score for your home, but if you’d like to share your home’s energy efficiency publicly you’ll have to get a new rating. What is the best rating I can get? Zero Gigajoules (GJ) is the lowest and best rating you can get, and that would be for a house that produces as much energy as it uses (usually with solar photovoltaic panels). This is also called a Net-Zero house. How do I get a label? By participating in Efficiency Nova Scotia’s Home Energy Assessment program, you will get an EnerGuide label for your home. You will also receive a Homeowner Information Sheet, providing details on your home, and a Renovation Upgrade Report, providing recommended upgrades. If you choose to complete some or all of those recommendations, our energy advisor will return to your home, free of charge, to confirm those upgrades and to give you a new EnerGuide label, to show your improved rating. If the home has not been built yet, check out our New Home Construction program. For $99 one of our energy advisors will model your building plans and let you know approximately what EnerGuide rating you could get from those plans, and then how to improve it even further. What info would I be sharing with the public? Why would I want to share that information with the public? Sharing this information on Viewpoint’s website allows you to show off how great and energy efficient your house is. Allowing us to share your EnerGuide rating, gets you the assessment for $99. If you’re trying to sell the house, the rating gives you a competitive advantage. The more information a potential buyer can get about a property the less worrying they need to do about the unknowns. If you just bought it, or you’re thinking of selling it in the near future, getting the house rated is a great first step in learning what energy upgrades the house could use. As more people share their labels, we can build energy literacy in the community and make energy efficiency easier to access and understand. What’s the difference between a home inspection and an energy assessment? Visual inspection of the property’s condition to identify if something isn’t working properly or is unsafe, if repairs are needed, and possibly if there were problems in the past. An analysis of a home’s entire building envelope (i.e. the heat loss of the home), space and water heating equipment and ventilation system. Homeowners receive customized recommendations to help you save energy and money. It costs $99 to have an energy assessment and receive an EnerGuide rating as part of this project. This is the cost of the assessment for this project regardless of the heat type of your home, thanks to funding from the Province of Nova Scotia. Please note, only electrically heated homes are eligible for Efficiency Nova Scotia rebates/incentives at this time. If the home is electrically heated, and you perform eligible upgrades, then you qualify for up to $5,000 incentives through our Home Energy Assessment program. Mortgage insurance helps consumers buy a home sooner and with a lower down payment. Buyers with less than 20% down payment are required to purchase mortgage premium insurance. All mortgage premium insurance providers offer rebate programs to encourage home buyers to buy efficient or upgrade a home’s efficiency. Use mortgage financing and perform upgrades and you may be eligible for up to 25% mortgage insurance premium refund! Talk to your REALTOR® and lender to learn more. Visit CMHC, Genworth or Canada Guaranty for full details. What is an average EnerGuide rating for a home in Nova Scotia? What we’ve found so far since launching the new EnerGuide rating system is that the average score for homes rated in Nova Scotia is around 115 Gigajoules (GJ). That said, depending on a home’s age and size, that rating can vary quite a bit. Buying or selling a home? An EnerGuide rating can help.